Discus provides some of the most detailed and extensive DISC profile reporting available anywhere. Not only are Discus personality reports filled with relevant information, but they're also created individually to reflect the precise patterns in a set of personality results. A Classic Discus report includes everything you need to get a full overview of a personality style. As well as extensive and accessible graphs and diagrams, it also includes a textual analysis describing the individual details of a personality profile, covering a range of ten different subject areas. The Enhanced Report extends the Classic format to include no fewer than eleven extra sections of analysis, covering topics ranging from specific work roles to behavioural interview questions. Creating an Enhanced report also automatically unlocks the Feedback Report for the same set of DISC results. 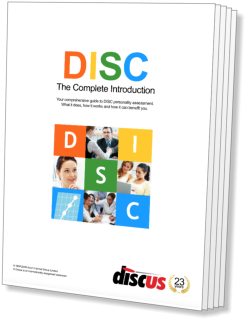 An Outline report is designed for DISC experts. It includes basic DISC information such as graphs, but without the full analysis features of a Classic or Enhanced report. Outline reports are a highly cost-effective solution for experienced DISC users. A Discus Feedback Report is a DISC report designed to be accessible to the person completing the questionnaire, giving them useful feedback on their results. It discusses broad topics directly relevant to the candidate, covering subjects from communication style to work style and career options. The Discus Motivation Spectrum Report is a highly focused look at a crucial element of the personality: motivation. The report considers eight different motivation factors derived from a candidate's standard DISC scores, and discusses how each of these factors will affect a person's levels of engagement and commitment. Job Matching involves matching a candidate's personality profile against an ideal pattern for a given role, a pattern we call a Job Profile. Discus' Job Matching suite includes a range of reports to help you find a candidate for a job, or a role that suits a candidate. You can also use the Job Profile report to review the requirements of any role. A Job Match report is an optional part of the main personality report, looking at the ways a person fits with the ideal personality needs of any job or role. Included is an assessment of any notable strengths for the role, as well as a discussion of potential limitations. Job Match reports can be freely incorporated into the main personality report for any candidate. To create a Candidate Match report, Discus takes any role and searches your database to measure appropriate candidates against that role's personality needs. It looks in detail at a single candidate's suitability, but also includes a comparison of related individuals to help find the optimum match or matches for the role. A Job Profile describes the personality requirements of any role, and Discus includes everything you need to create and manage Job Profiles like this. A Job Profile Report summarises the key features of any role, whether its profile comes from Discus' extensive library, or from your own custom profile. Beyond personality and job reports, Discus can go further and look at the ways that individuals work together. There are two different approaches available: a relationship report that examines the dynamics in a single working relationship, and a team report that examines the workings of an entire group of different personality types. Discus relationship reports highlight the most important dynamics in action between two individuals, helping to explain the way those two people will build a working relationship. Relationship reports include an analysis from the point of view of each of the two personalities involved. Discus can create a team report for any size of team, looking at the ways the personalities of individual members interact with each other to affect the team as a whole. The report looks at distinct team roles and team dynamics, and highlights key issues surrounding the team's leadership role. See reports instantly: All Discus reports can be viewed directly through a browser. That means that, the moment a questionnaire is complete, you can view the DISC results right away. Custom content: Discus reports give you complete control over report contents. Tailor and customise the report contents to suit your exact needs. Reports in PDF format: All Discus reports are available in PDF format, making them easy to copy, print or e-mail. The examples on this page all use the PDF reporting feature. E-mail with a click: Discus includes its own e-mail system, so you can send a copy of any PDF report through e-mail simply and directly. Fully automated reporting: You can set Discus up to create reports automatically. For example, when a candidate completes a DISC questionnaire, you can request Discus to e-mail a copy of the report the moment it's available, or even pass on a Feedback Report directly to the candidate.